This is sponsored post. All opinions are mine alone. The following content is intended for readers who are 21 and older. Coca-Cola™, grab a sandwich from ShopRite® and a bowl of this easy antipasto salad. Have you ever attended the Food Network & Cooking Channel New York City Wine and Food Festival Presented by Coca-Cola™? This popular event held in New York City is on my foodie bucket list! You simply can’t go wrong with 4 days of the latest trends and seminars about food..food..and more food! This year’s festival is set for October 12 – 15, 2017. The Food Network & Cooking Channel New York City Wine and Food Festival Presented by Coca-Cola™ is one of the largest food and wine festivals in New York City! The festival includes more than 100 events, where visitors will get a taste of hands-on classes, educational seminars, wine tastings and more. This year, ShopRite is sponsoring the Grand Tasting. If you are a ShopRite shopper, like me, you can enter the Food Network & Cooking Channel New York City Wine and Food Festival presented by Coca-Cola sweepstakes. Yep, you can text to win travel and lodging for 6; 6 one-day access tickets to the event on 10/15 AND the winner will have the opportunity to assist celebrity chef, Scott Conant, during the “Grand Tasting” sponsored by ShopRite. To enter the sweepstakes, simply text the keyword SHOPRITE to the short code 26739. The winner will be selected on, or around September 18, 2017. Before you head out to this year’s festival, grab yourself a quick bite to eat. 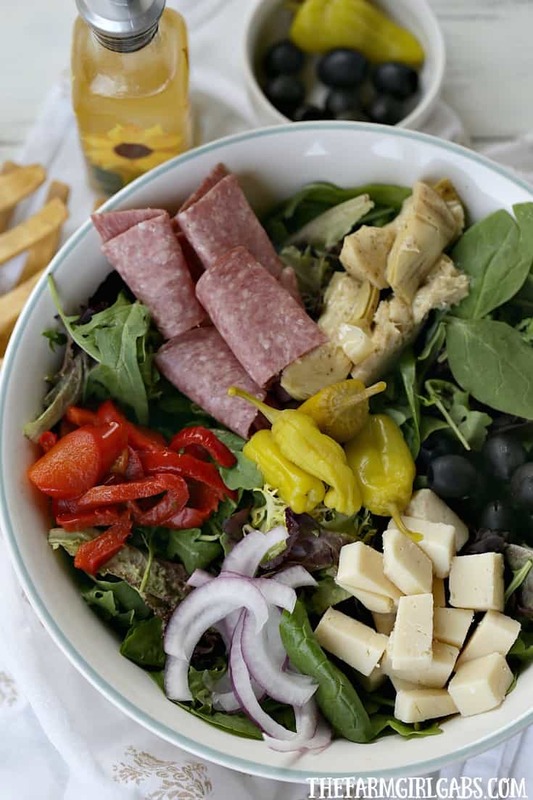 This Easy Antipasto salad paired with a ShopRite Kitchen 8” Sub and a refreshing Coca-Cola is a delicious on-the-go meal. ShopRite has perfect on-the-go meal solutions. Coming from an Italian family, a traditional antipasto salad was the start to every special occasion or holiday meal. But why save this delicious salad for a special occasion? It’s perfect for lunch or dinner. It can practically be a meal in itself. To prepare, grab some lettuce or salad mix from ShopRite. Then top with a few slices of salami, provolone cheese, olives, onion, pepperoncini, red peppers and marinated artichokes. Finish it all off with a simple vinaigrette and you are all set! You can save on meal bundles at ShopRite. Be sure to check out other bundles like this one where you can save money. Add a 16oz Coca-Cola™ or 20oz FUZE Fusion® for .50¢ when you buy a 11.25-11.75oz Ready Pac Multi-Serve Salad in a single transaction with your Shoprite PRICE PLUS® Club card between 8/27/17 – 12/31/17 while supplies last. Taxes and Deposits Extra where Applicable. 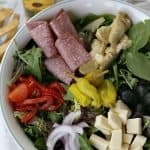 Why save this Easy Antipasto Salad for a special occasion? 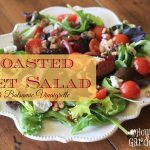 It's an easy Italian salad recipe that can be enjoyed anytime. To make vinaigrette, add vinegar, salt, pepper, oregano and garlic powder to a jar. Place lid on top and shake well. Add oil and shake well again. Set aside. To assemble salad, place spring mix in a large bowl. Arrange ingredients on top. Drizzle with vinaigrette. Would love to take my daughter to this. We own a pizza shop in Morgantown wv.